There is a lot in Fiddler on the roof: love, faith, family, separation, tenacity of the human spirit, violence, hate, prejudice, change, persecution, rebellion, sense of community, anti-Semitism. But most of all, traditions. The characters are real, genuine and down-to-earth. They're strong, hard-working people, who have their priorities straight. There is sentiment in this musical, but without a granted happy ending; there is weight of reality, but the characters can dream; there is happiness and optimism, but the feeling that things can get worse – and they will. The story revolves around the highly sympathetic figure of Tevye, a poor Jewish milkman in the little Russian village of Anatevka, in the early 1900's. We see him as a man mired in traditions, struggling between his devout faith and the changing times when three of his daughters feel the urge to marry. Can love win over traditions? Fiddler on the Roof it is not a new musical. It ran on Broadway from 1964 to 1972 and received a special Tony Award in 1972 for being the longest running musical in Broadway history. Andy Nyman is magnificent as the main character. His performance is gigantic. His way to talk to his wife, his daughters, to God ("You have made so many poor people" he says to God "I realize it is not a crime to be poor...but it's no great honour either!”) and to the audience at the same time is absolutely captivating. Jonathan Lipman's costumes are beautiful, the set, designed by Rober Jones is perfect in every detail and the limited space of the Menier gives a sense of intimacy with the characters; the whole cast give strong performances: Joshua Gannon as the shy Motel and Stewart Clarke as the idealistic and revolutionary Perchik , and of course Judy Kuhn as Golde, Tevye’s wife. The scene of Tzeitel's wedding is magnificently choreographed by Jerome Robbins, and it gives a great idea of the solemnity of the sacred marriage vows under the Jewish canopy. The music is well famous: Fiddler plays its beautiful melodies, especially effective during the moving, emotional ending. 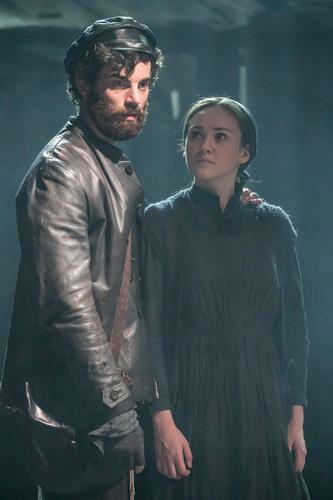 Even if there are more vibrant and modern musicals out there, Fiddler on the roof is a poignant story brought beautifully to life by Trevor Nunn's revival that teaches us that the most uncompromising tradition is that nothing stays the same.